With the deadline for submission fast approaching, Aevidum’s advisors were scrambling – they were without a fair queen candidate. Days before the nomination was due, the club’s advisors turned to vice president Megan Doolittle, pleading with her to be the one. She was hesitant, but after her parents assuaged her apprehensions and encouraged her to go for it, she accepted, much to the delight of the advisors. She acknowledges the contest’s importance in the area, and although she is not keen on public speaking, plans to approach it like any other challenge. Moreover, participating in the Fair Queen contest affords Aevidum publicity and potentially financial support, both of which are important at this juncture. “It’s good to be able to get money for my club because we are a new starting club,” Doolittle explains. Aevidum needs money for many of its projects that aim to make the school a better place, namely its initiative to obtain a facility dog (see previous LSNews.org coverage). However, money is far from the primary motivator for Doolittle. She has enjoyed the fair since moving to the L-S area from Georgia at a young age. “I’ve been going to the fair ever since I moved here ... I always really enjoyed it. I was in the baby parade. I never really entered anything in the fair, but I always liked walking around and looking at everything. My favorite is the art … the photography and the art,” she says. As for the fair queen contest, Doolittle says she has watched it in years past. “For me, even in the stands, it was very nerve-wracking, and I wasn’t even talking,” she confesses. Aside from Aevidum, Doolittle plays an instrumental role – literally as a regionally-renowned trumpeter and figuratively as a highly-visible leader – in the L-S music department as a drum major in the marching band, and member of the concert band, jazz band, pit orchestra, and full orchestra; she is also president of the Tri-M Music Honor Society, executive producer for WLSH, and participates in Interact, Fellowship of Christian Students, Heroes, LSNews.org, and is active at Cornerstone Community Church. Doolittle plans to attend college – perhaps at Liberty, Robert Morris, or Grove City – to study middle school education focusing on history. 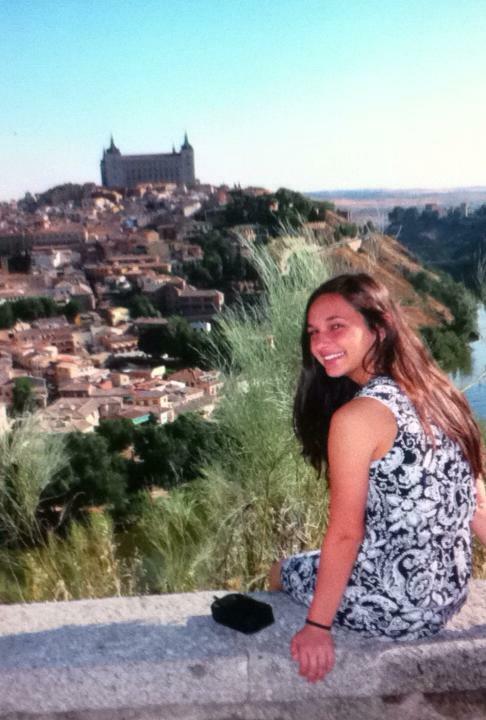 Her recent attendance on the school’s Spain trip, which she described as an “amazing experience” that influenced her to consider ESL as a possible minor. Editor's Note: This is the first of seven feature articles LSNews.org will be publishing previewing the annual Fair Queen contest at the West Lampeter Fair, held from September 23-25 at the Fair Grounds. Stay tuned over the next seven weeks; each Friday will be "Fair Queen Friday" -- we will publish the next feature. Here is our Fair Queen page, with all the information.